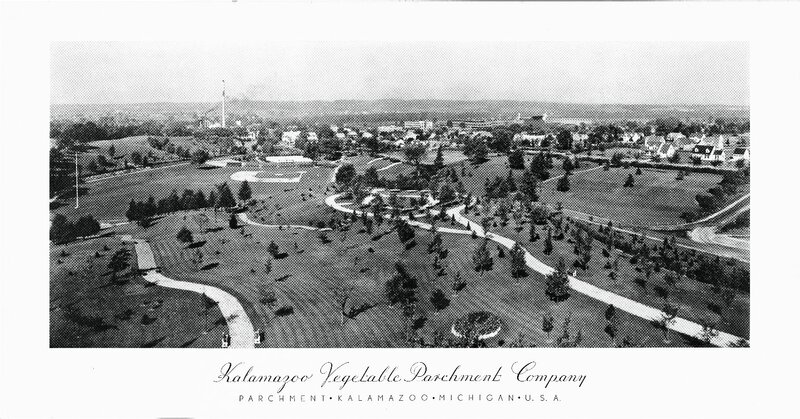 Kalamazoo Vegetable Parchment Plant buildings and smokestacks and town of Parchment as seen from aerial perspective, looking west. Foreground shows Kindleberger Park, with baseball diamond near center of image. Bottom of poster includes caption, Kalamazoo Vegetable Parchment Company PARCHMENT KALAMAZOO MICHIGAN U.S.A.